Look no further, this is it; the fast, easy-to-make, moist and fudgy chocolate cake of your dreams. Since I first discovered the recipe two months ago, I’ve made it three times. The F.C. (a pathological chocolate addict) now requests it. The cake is ideal for dinner parties, it’s so potent and satisfying, you don’t need much to feel the buzz. I also like this cake because the butter and egg content is less than in other similar recipes I found. It doesn’t rise much (as you can see in the photo) which gives it a modest elegance. I just love having a recipe like this in my arsenal. When I’m in a pinch for a quick but classy dessert, I can always turn to this one. (It’s the “little black dress” dessert equivalent.) Your dining companions will also be intrigued when you tell them it’s flourless. High density chocolate heaven. Chop chocolate into small pieces. In a double boiler or metal bowl set over a saucepan of barely simmering water melt chocolate with butter, stirring, until smooth. Remove top of double boiler or bowl from heat and whisk sugar into chocolate mixture. Beat eggs then whisk into mixture well. Sift 1/2 cup cocoa powder over chocolate mixture and whisk until just combined. Pour batter into pan and bake in middle of oven for 15 minutes, or until top has formed a thin crust. Invert onto a serving plate. 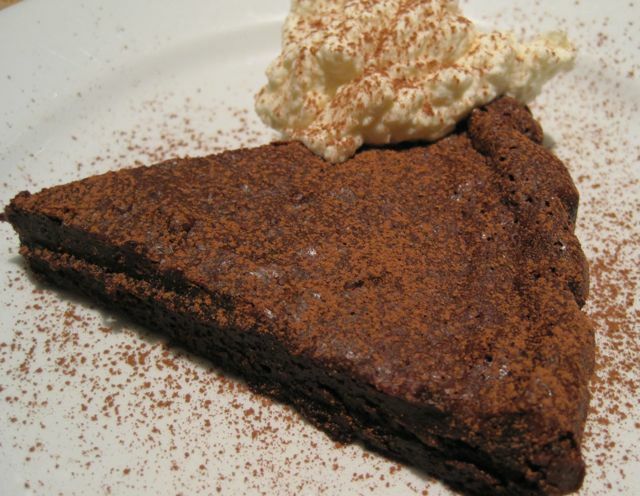 Serve with whipped cream, rasberry coulis or a simple sift of cocoa powder or icing sugar. Divine! Serves eight. This entry was posted on Sunday, January 31st, 2010 at 12:48 pm	and is filed under Uncategorized. You can follow any responses to this entry through the RSS 2.0 feed. You can leave a response, or trackback from your own site.